With Footy Finals Fever in full swing one thing I know everyone can agree on is the need for something delicious to munch on while you cheer your team onto glory! With that in mind, one of my all-time favourite finger foods would have to be chicken wings. They can be cooked a thousand ways, eaten with your hands and downed between sips. 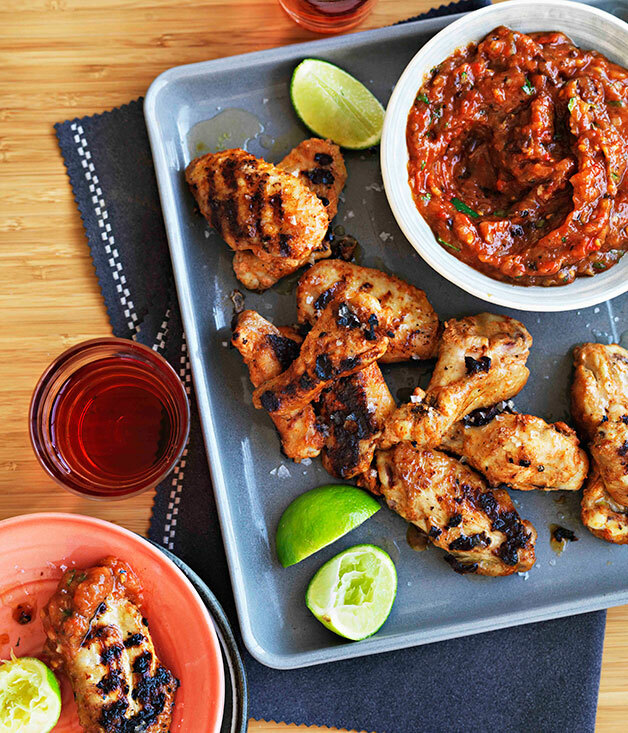 Without further ado let me introduce to you one of the most deliciously, devilish chicken wing recipes I know – Spiced Chicken Wings with Roast Garlic and Chipotle Sauce. Whisk buttermilk, spices, oil and lime rind in a bowl, season to taste, add wings, stir to coat and transfer to a non-reactive container. Cover and refrigerate overnight to marinate. For roast garlic and chipotle salsa, preheat oven to 180C. Wrap garlic in foil, roast until tender (40-50 minutes), cool slightly, squeeze flesh from skin and set aside. Meanwhile, place tomatoes cut-side down on an oven tray lined with baking paper, add onion, drizzle with oil, season to taste and roast until tender (35-45 minutes). Cool, peel tomatoes, process in a food processor with remaining ingredients to a thick sauce, season to taste and set aside. Preheat a barbecue or char-grill to medium-high. Drain wings and grill, turning occasionally, until golden and cooked through (8-10 minutes). Season to taste and serve hot with salsa and lime wedges. Best served with a Rose, pear cider or icy cold beer! Enjoy! Oh and go Freemantle! Oh man, those look soooooo good!! !